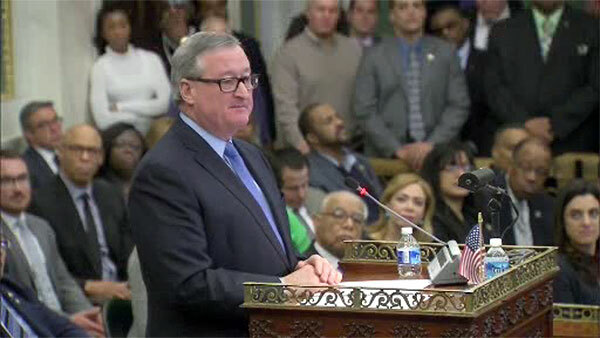 PHILADELPHIA (WPVI) -- Philadelphia Mayor Jim Kenney presents his budget to City Council Thursday. It's the second budget of his administration. Council members were in and out of closed door budget briefings Wednesday in advance of the $4-billion spending plan the mayor will formally submit in a day. All were pleased with the basic elements they heard from the mayor's staff. "I could say there were no new taxes proposed in this budget. Some additional spending opportunities for the city and doing a better job of collection of taxes that are out there currently," Councilman Mark Squilla said. "We see some real emphasis on infrastructure improvement which is resurfacing streets, that kind of thing," Councilman William Greenlee said. The line by line details of spending plan will not be released until midnight in advance of the mayor's formal address in City Council; the Council does not have to OK the new budget until late spring. "Residents of the 9th district will be pleased that the administration is putting a heavy focus on infrastructure investment," Councilwoman Cherelle Parker said. "The administration has a plan to get our pension fund in the next 13 years to an 80% funding level which is huge. Wage taxes are going to go down about 5%, from 3.9 to 3.7," Councilman Allan Domb said. Council members are emerging from the closed door briefings clearly delighted that this spring they're not being confronted with a choice of raising taxes or cutting services.